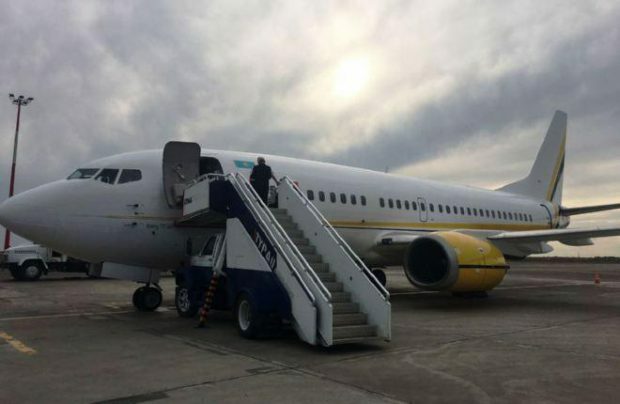 Sunkar Air, a privately owned Kazakh airline which has been active on the local charter and business aviation market since 2015, has put two Boeing 737-300 narrowbodies in commercial operation. One of the aircraft, UP-B3717, made its first revenue flight for the operator on 19 June on the Atyrau-Almaty route. The other airliner joined the carrier’s fleet in early May. No information is available on its registration code, but the aircraft is confirmed to have been registered in Kazakhstan. According to open sources, this 737-300 (serial number 26428/2196) was built in 1991, and was previously operated by Lufthansa. Both aircraft have the same cabin configuration and will be used for charter flights, the operator says. UP-B3717 has performed several domestic flights so far, including between the country’s capital city Astana and Aktau. Sunkar Air’s fleet includes a single Bombardier Challenger 850 seating up to 15 passengers. The carrier also operates a mix of Embraer Legacy 650, Cessna Citation 750, Hawker 900 XP, and Beechcraft Premier I airplanes provided by partners. The Kazakh airline appears to be the only commercial passenger operator in all of the the CIS to have entered the commercial UAV market. In February this year, the carrier won a North Caspian Operating Company (NCOC) as part of the North Caspian Sea Production Sharing Agreement. The NCOC territory under the program includes Kashagan, one of the largest oil fields in the world, as well as the Kalamkas, Aktoty, and Kairan fields. Sunkar Air’s UAVs started flying for the company in April 2017. The operator is tasked with pipeline monitoring, ice patrolling, and environmental missions. Its UAVs are equipped with video and thermal-imaging cameras, and also carry gas analyzers that stream real-time data to the operator’s ground control station.